Tabletop fanatic and host of the popular Cardboard! 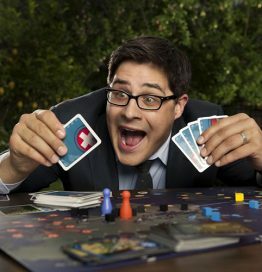 podcast, Rich Sommer will be making his first trip to the Southern-Fried Gaming Expo this year. Although his love for gaming is well-documented, you may better recognize Rich from his role as Harry Crane on 92 episodes of the popular AMC drama Mad Men or recurring appearances on Netflix’s Glow, The Regular Show, or Wet Hot American Summer: Ten Years Later. Rich will be speaking at two panels that will be immediately followed by meet and greet sessions.